Final MS Paint version of the map. 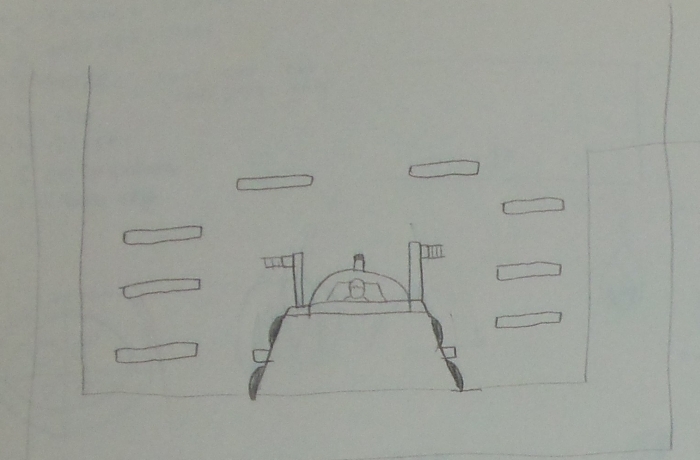 These are drawn before I make any of the actual rooms. It's very important to have things like the room numbers and how it all connects together planned in advance. This one in particular went through a few revisions, it was originally smaller, then expanded to be even larger until I finally settled on the third revision above. Stage 1 was definitely an interesting experience, as I was still feeling things out with how to do map layouts. It's certainly the most un-even stage in terms of checkpoints, and has frequent misdirection to appear non-linear. At this point the game was actually intended to be one single file, so while it is by far the smallest stage, in the context of a single file game, it's way too big. 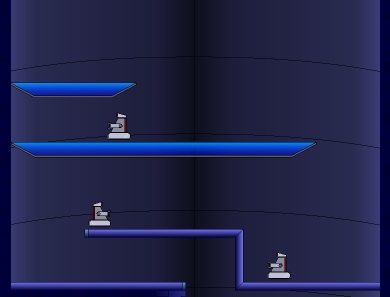 Luckily this meant when I decided to split the game up into stages, Stage 1 wasn't too small to stand on its own. 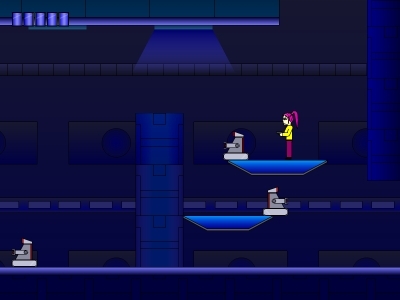 Early versions of stage 1 had several very awkwardly designed rooms which I later changed. There are still a few odd rooms though, like this one. Until this point in the game, the game actually had no ceiling code, which I quickly realized by this point was going to be essential. This room has a unique landing sound effect, it's pretty hard to hear under the music though. Occasionally I would draw potential enemies in a notebook. 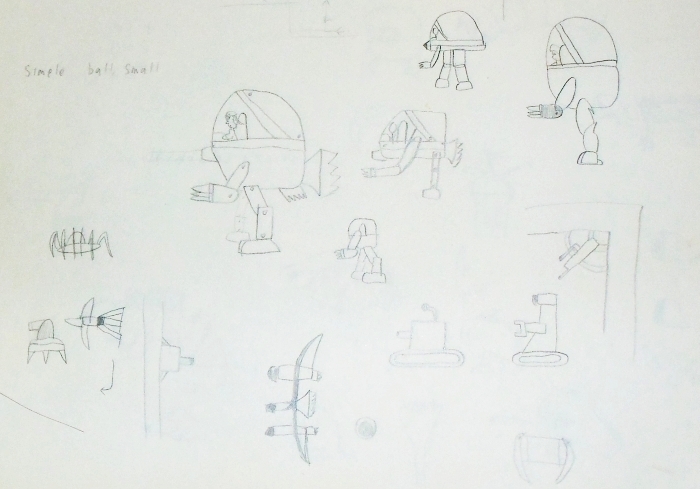 While this page was drawn in 2008, a few of the designs didn't get used until much later, in stages 5 and 6. There are several attempts at Mizar's first mech here, they didn't look right at all, leading to her starting off in a tank form instead. One big oversight is that stage 1 used a lot of of the best simple enemy designs, but then didn't want to reuse anything in later stages. This worked for a while for the non mechanical stages, but by stage 5 and especially 6, stage 1 has to lose its exclusive rights to things like wall turrets and rolling bots. The flight of the orb enemy was reused many times though. 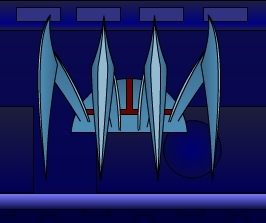 When initially coding the enemies, I was using placeholder art from Project Inthri 3, which this enemy is from. Visually he fit so well that I ended up leaving him in anyways. 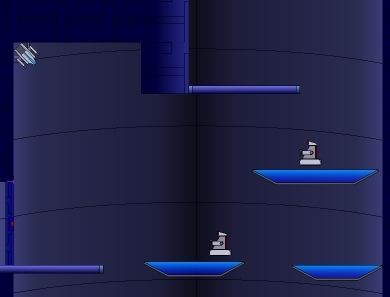 These enemies were added very late to the game, as early rooms were populated with only the small robots so it was very repetitive. They are based off the rats from stage 3, and while I tried not to reuse enemy designs, since there were no "jump off the edge of a platform" enemies in stage 2, I let this one slide. 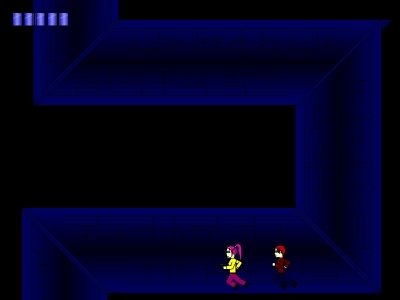 The first hunters appear in stage 1, although very briefly. All they do here is either stand still or run in a single direction, I didn't bother coding their real AI paterns until stage 3. Carina holds her gun by her hip, but the hunters extend their arm all the way out. This is so that their bullets will fly a bit higher, allowing Carina to duck under them. As you can see though, it's a very tight fit. I tried to squeeze Carina's ducking animation as low possible, but this was her limit without looking completely silly. 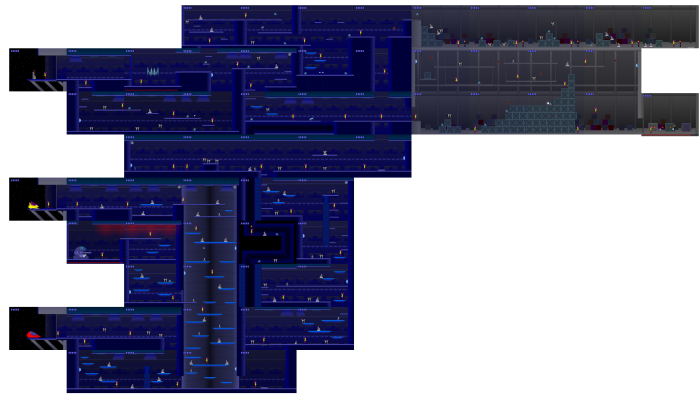 Originally, each stage was only going to have two bosses, a mid-boss that would give you a new weapon, and the end boss. Since this boss gives you nothing, that means it was added into my plans a bit later on. I put this boss in because the game already felt like it was getting a bit long and could use something to break things up. I was also unsure about Avior being the very first boss, since it's a pretty weird fight, just duck the entire time. Rough versions of Mizar's tank form. At first I had her throwing out attacks at random, but that made her reallly difficult. Now she just does them in order. Another totally different idea for Mizar in this stage was to have her pop up from the ground in... whatever the heck that thing is supposed to be. The four dark spots on her side would have been the areas that you had to shoot. You may have noticed that in an early version on previous page, it was the machine gun that pushed enemies, not the handgun and rocket. This ties into a very preliminary idea for the cargo bay area, where after getting the machine gun from Avior, you would use it to push the crates around, opening up a new way out of the area, instead of simply taking an elevator to escape. I quickly realized this was a bit beyond my coding abilities though, and that if the machine gun was the weapon to push enemies, it would be pretty overpowered, so that trait was passed over to the slower weapons. This was the laziest case of writing in the entire series. 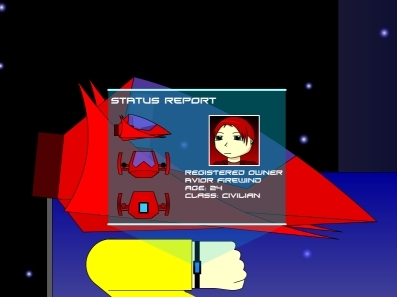 With this simple scan, Carina is now able to track Avior's ship across the entire universe, as well as learn his name at the same time! Before Challenge Mode existed, I had six special modes you could activate to impose a handicap. All of these were based around stage 1 though, and tended to not really work well in the later stages. I wasted a lot of time and effort making these work in every single situation, only to come to accept the fact that no one would even bother playing through the game over 6 times to see everything. Eventually I just consolidated everything except Speedrun into Challenge Mode, which was something I had wanted to add into Project Inthri 3 earlier, so it worked out better this way. Coming up with unique challenges was a lot more fun once I didn't have to worry about making it work throughout the entire game.